It is the place par excellence of the center of Madrid, just in front of the monument can be found Kilometer Zero, from where all roads begin Spain and whose picture is very typical stepping on tourists. The Puerta del Sol is composed of a clock (the most famous of Spain) that has a big ball that rises and falls at 12 hours (morning and night) and is the star on the night of December 31 day in which all Spanish makers are 12 grapes at the stroke of the clock that is maintained and regulated by the best watchmakers in the country to enter a new year with joy and a good start. The building where the clock is called the Casa de Correos (though not the seat post) that has two plates in honor of the popular uprising of May 2 against the French and another set recently because of the attacks made on 11 March 2004 in honor of his many victims and the people who helped in this tragic event. In front of the Puerta del Sol, in the middle of the square is the statue of Mariblanca and the statue of Charles III on his horse that was added recently (in 1994). Looking to the building, to the right we find a pastry called The Mallorcan where they eat the best Neapolitan city (located next to a Metro stop Sol). And finally clock in front of the building and the statue is the largest meeting place for both locals and shield symbol of the capital, the statue of the bear and the tree. In this place you can reach by subway and get off at the Puerta del Sol station or catch different buses stopping in this area and they even have the head in this place, these buses are 5, 20, 51, 52 and 53. Up the street from the bakery "The Mallorcan" turning left or up the street "Post" arrived at the Plaza Mayor. Surrounding this square is the Casa de la Panaderia which consists of a four-story building topped with an attic above by two towers that currently pointed end use is for the Tourist Board Hotels.com guest and is where Tourist Center city. On top of this building you can see a shield of Spain dating from the time of Charles II. In the center of the square we found the statue of Felipe III mounted on horseback by sculptor Giambologna of Italian with the help of his pupil Pietro Tacca. This statue was a gift from the Grand Duke of Florence. Among the nine arches that surround the square and serve as entry and exit gates of the square stands the Arch of Cutlers, which is the most famous because it is a work of Juan de Villanueva. This arc was called in this way because it gave entrance where stood the guild of Cutlers when the square was used for this purpose, about this arc are many typical restaurants Hotels.com guest such as the Sobrino de Botin is the oldest restaurant in the world because its foundation took place in 1725. Today the square is used as Christmas attractions and there is a Christmas market around the statue of the king which are very typical Spanish Christmas decorations especially belen and accessories therefor, is also common Christmas tree sales (spruce) to decorate at this time and also posts items of jokes so it's very common to buy a wig, itching powder or for the more stink bombs little thugs. After a stroll through these posts if it's time to have lunch or dinner you can not miss the squid sandwich serving the majority of the bars that are around the square or on side streets. The feast of San Isidro Madrid pattern also held in this square in the square installing terraces of the bars that are located in the arcades. And finally this is where the Grand Parade ends of the Magi is celebrated on January 5 illusion spreading to all children in Madrid. Sun Rising from the street price where you can stop for shopping in stores on either side and is where lies the English Court arrived at the Plaza del Callao that shows the Gran Vía down this street leads to the Plaza of Spain, a very picturesque surrounded by the Building Madrid Spain, one of Madrid's most important skyscrapers, measures 117 meters and is composed mainly offices and Madrid Tower. In the center of the square we can see different sources including one dedicated to Miguel de Cervantes tells his statue. Near this square is the gift Egyptian Temple of Debod. Following the Gran Via where we left earlier and where we can see many buildings with a special charm, we Argüelles, an area with many bars for the night and a commercial area where you place another Corte Ingles. Passing this area and following up the street we find a new area: Moncloa. This is the ultimate meeting place for the locals, due to the large underground bus interchange and it has. In the center of Moncloa is the Arch of Victory built in commemoration of the victory of the Spanish Civil War in 1953. In Moncloa also found the Air Ministry a landmark of the city. At the end of the Gran Via we find a large and beautiful park: West Park one of the lungs of Madrid which lies between Corunna Road and University City where you will find many of the powers of Madrid. In the middle of the park is the Fountain of Villanueva is a beautifully illuminated. The park is also found "The Rose" which features every year with an international competition in which we participate with roses. It is located in the center of the square that bears the same name, can be reached by Metro Station Bank of Spain. The statue is made up of the goddess Cybele mounted on a chariot pulled by two lions. This source is the venue of the Spanish football team Real Madrid that crowned goddess with a scarf and a flag of the team when they win a football title. 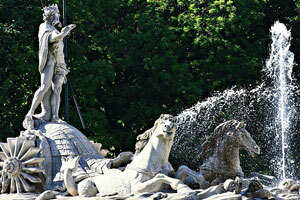 Fountain designed by Ventura Rodríguez, is made of white marble and is formed by the god Neptune on a large circular block. In his hands he carries a trident in his left hand and a snake coiled on the right, God is standing on a shell drawn by sea horses whose tail is fish and surrounded by dolphins and seals from where the high water jets . This fountain is the place where the Spanish football team, Atletico Madrid celebrates the titles. Other fountains that should be highlighted in this city are the Power of Orpheus, the Triton Fountain, the Fountain of Shells and the Fountain of the Fallen Angel among others. Place where the episcopal see of the Diocese of Madrid. This temple is 73 meters high and 102 meters long and can be seen as the Romanesque Revival styles (crypt), Gothic (inside) and neoclassical (facade). This in front of the Royal Palace and is accessible by your side door Bailen street. The cathedral is open from 10 am until 19:30 and the crypt is open from 10:00 until 20:00. Located in the barium Sales (Ciudad Lineal) is the largest cemetery and the city and is among the largest in Western Europe. Because these dimensions there is a bus network inside to move. It is so great because it was the only cemetery in Madrid until the twenties that South Cemetery was built in the district of Carabanchel. Other cathedrals and churches that are worth noting are the Basilica of San Francisco el Grande, Parish of the Virgen de la Paloma and San Pedro el Real, or the Church of St. Gemma. Between the lungs of Madrid are the Park West located in the Moncloa area mentioned above, the Retiro Park which hosts many fairs every year, including the Book Fair and the largest entirely: The Casa de Campo. The Country House is situated west of Madrid, was hunting property royalty and Spanish Crown, today is a public park. Inside you can enjoy a large lake where you can see a big carp and ducks asking some food and here are also theme parks like Hotels.com guest Amusement Park and Zoo Aquarium of Madrid which can be accessed from the Batan metro station. This museum houses a large collection of Spanish, Flemish and Italian. It is located near Paseo del Prado between Atocha metro stations and Bank of Spain. Masterpieces of Goya, Titian, El Greco, Rubens, Velasquez and Eduardo Rosales can enjoy this museum. The hours are from 9:00 to 20:00 from Tuesday to Sunday and holidays included being closed Mondays. Free admission Tuesday through Saturday from 18:00 to 20:00 and Sunday from 17:00 to 20:00. The rest of the time the box office entrance costs 6 € and the reduced fee is 3 € (large families, youth card) also free admission every day for children under 18 and pensioners (necessary accreditation). In this museum are the works of art of the twentieth century, is located in the Atocha (located near the subway and railway stations with the same name). Picasso, Dalí and Joan Miró are the protagonists of this museum being the most famous painting Guernica, which captures the horror of war to a people. The hours are Monday to Saturday from 10:00 to 21:00 and Sunday from 10:00 to 14:30, closed Tuesdays being. Admission is free every Saturday from 14:30 to 21:00 and Sunday from 10:00 to 14:30. The rest of the time the entry being reduced costs 6 € (3 €) for Youth Card holders, students over 18 years, large family and can benefit from free entrance to children under 18 and pensioners. Located on Calle Serrano 13, is a place to discover the secrets of human evolution, very entertaining for children and adults. It is open Tuesday to Saturday from 9:30 to 20:00 hours and on Sundays and holidays from 9:30 to 15:00 hours remaining closed Mondays. The entrance to the museum is free. Museum located in the Paseo de Recoletos, in this place you can see magnificent statues made of wax from celebrities such as footballers and actors to cartoon characters like the Simpsons. It can be a place of leisure for children and adults. Museum hours are 10:00 to 14:30 and from 16:30 to 20:40 being on Saturdays, Sundays and holidays uninterrupted schedule. The entrance fee is 15 euros for adults and 9 euros for children between 4 and 10 years and those over 60 years. The Royal Palace also called Palacio de Oriente, was a work in which also participated Francesco Sabatini. It is the largest royal palace in Western Europe extension (over 2800 rooms and 135.000 meters square). Apart has an outstanding collection of Stradivarius. This palace was used as a royal residence until the 30s Spanish and currently residing in the Zarzuela. Today only used for state celebrations and can be visited by the public. Inside you can enjoy paintings of great artists among which Velázquez, El Greco and Goya and tapestry, porcelain and furniture of great value. The hours are from 9:30 to 17:00 on weekdays and 9:00 to 14:00 on holidays, changing the schedule in the summer when the palace is open from 9:00 to 18: 00 on weekdays and 9:00 to 15:00 on Sundays and public holidays. The days are official ceremonies the palace is closed to the public. The ticket price is 10 euro base rate and the reduced rate 6 euros. It is located in the neighborhood of El Pardo in the mountain called by the same name. I had built by King Charles III and also participated Francesco Sabatini. Today is National Heritage and is open to the public. The schedule is the same as the royal palace in Madrid. Admission is € 10 and reduced input costs 6 €. Other important palaces are the Palacio de Linares, Palacio del Buen Retiro, Palacio de Cristal del Retiro and the Palacio de la Zarzuela among others. Located near the Cibeles and the Retiro Park, this monument is located on the street with the same name, in the Plaza de la Independencia. It was built by King Carlos III and it is a work of Francesco Sabatini. It received its name because it is the road to Alcalá de Henares, another town in the community of Madrid. Philip IV was the candidate to build, is located towards the center of the city and surroundings every Sunday there is a market: the trail where you can buy items of all types: old, second-hand or hard to find. This monument is so named because it formerly crossed this place to go to the city of Toledo, and was the entrance to Madrid which shows the tremendous growth that has taken this city. Ancient Egyptian temple located near the Plaza of Spain next to Paseo de Pintor Rosales. This gift offered by Egypt is open to the public and inside can enjoy Adikhalamani Chapel and Egyptian reliefs as axial and crypts rooms and a terrace corridors used for solar ceremonies. In this town worth visiting the Royal Palace with its gardens, used as a summer residence of Spanish royalty. It is very typical to get to this city in the so-called Strawberry Train where you can taste the fruit typical of this place while traveling in an old train showing the landscapes of the area. This train is only active in the spring time and only during some weekends. Village located close to the capital, which emphasizes the great monastery which Philip II had built, you can visit also the chair of the king, the Prince's House, the Church of St. Barnabas and Fresneda Granjilla the Renaissance garden. At Christmas time the city becomes a life-size nativity scene very curious to visit. Near this village in the mountains of Cuelgamuros, lies the Valley of the Fallen, a monument in memory of all those killed in the Spanish Civil War built by General Franco. Contains inside a basilica carved into the rocks where they are buried hundreds of Spanish who fought in the war as its creator axial and Jose Antonio Primo de Rivera. A place to stop for lunch, the restaurant La Genara is situated the village center. Village situated 50 km from the city of Madrid, include the Plaza Mayor built in the Middle Ages that has a bullring at the time of festivities. The Church of Our Lady of the Assumption, the clock tower and Convent of St. Augustine are also prominent buildings in this town. This village is situated in the basin of Henares, has different monuments and buildings of cultural interest such as Puerta de Madrid, Universidad de Alcalá, the birthplace of Miguel de Cervantes, the Comedy Corral is a former theater (1601) and the Royal Botanic Gardens Juan Carlos I. Village located west of Madrid in which stands the Palace of the Infante Don Luis now being restored. In this town a good place to eat though perhaps expensive the restaurant El Convento.